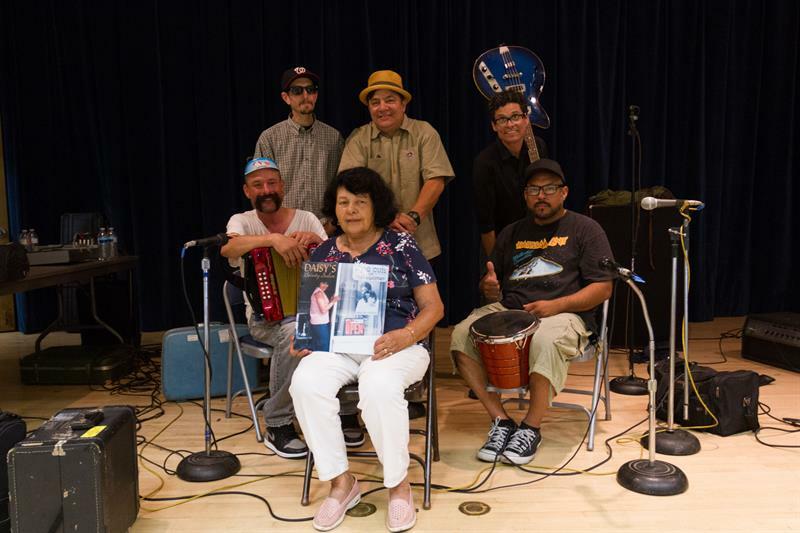 Colombian 74-year-old Daisy Guzmán, who has been living in Los Angeles for more than 50 years, is inspired by her experiences as an immigrant to write the songs performed by the vallenato group “Very Be Careful”, composed exclusively of Americans. What for Daisy began as a game with her children, Ricardo and Arturo Guzmán, ended up becoming the motor and soul of the group that her boys had formed together with Craig Martin, Dante Ruiz and Richard Panta. The immigrant recalls that on one occasion she told her children that she “had a song” for the group. They took her away and Mother’s Day surprised her by touching the subject. She liked how her “immigrant” stories sounded in one of Colombia’s indigenous music genres. Which has its origin in the Caribbean region of that country. “The gift is from her to us, because she has given us these songs that make people happy, we are the instrument to play it,” Arturo Guzmán, who plays the bass, told Efe. Daisy managed to convey to her children the love for Spanish and the cultural roots of her beloved Colombia. The work was not so easy, in 1966 when Daisy arrived in the United States, Hispanics had not won the cultural recognition they now have. However, she and her husband tried to keep their customs and love of the music of their country of origin at home. Ricardo learned to play accordion at the age of 6 and his brother also immersed himself in music since childhood. “They went to Colombia to get the Spanish better and when they came, they came with that Vallenatos thing,” recalls Daisy. Although the brothers had already discovered vallenateros such as Alejo Durán and Calixto Ochoa, the Guzmán went through several rock bands, corridos and other genres that were played in the city, before joining their other three friends to make “Very Be Careful” . The seven albums, the tours of the United States, Europe, Japan and Colombia itself are signs of the success of a group, interested not in the commercial, but in “the music of the people”, explains Arturo. For Dante Ruiz, of Mexican roots and who plays the bell, the group’s wealth is the diversity it represents. “There are Puerto Rican roots like Richard, who plays the box, or Craig, (of whom) nobody imagines that he plays the guacharaca in a vallenato group”. The connection of the public with his proposal is so great that Arturo Guzmán dares to compare the metropolitan area of ​​Los Angeles with Valledupar, the vallenato capital in Colombia. “We are raised here in California, with palm trees and wind and sea, and it looks a lot like it, although Los Angeles is a much bigger city than Valledupar, it feels the same in neighborhoods,” he says. And that connection with the neighborhood has been understood by Daisy and reflected in her songs. “Really all the songs are from real life, from people or from neighbors,” he says. Precisely the last work of this group is a recognition of the work of immigrants. The album “Daisy’s Beauty Salon” is a tribute to the beauty salon that the Colombian opened in 1978. The workplace became for almost ten years in the second house of the brothers who spent their afternoons there doing chores while their mom arranged the hair of their clients. It is that tribute to the struggle of its immigrants and the original sound of Los Angeles with which the group has harvested a large group of followers. “As soon as we play they start dancing and for us it is a dependent relationship,” says Arturo Guzmán. Daisy every time she can accompanies them to her presentations, because she knows that the goal of immigrant moms is to look for a better future for their children. “Everybody who knows me tells me: It’s because of you that they are there, because of their songs,” he reflects.